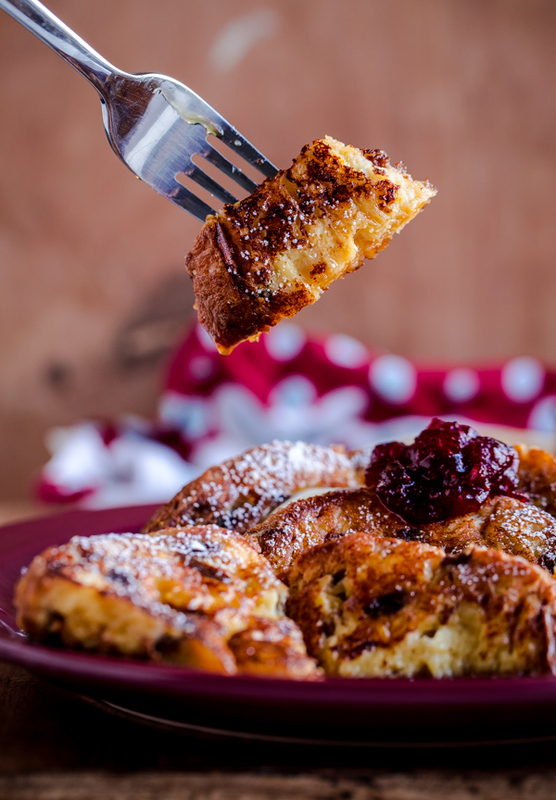 Panettone French Toast – classic Italian Pannetone bread is transformed into delicious and festive French toast for the holidays. Christmas morning, at my house, is filled with tradition. And by tradition, I mean food. And by food, I mean…a good loaf of Italian panettone. After slowly waking up and greeting the morning, my family sits down at our kitchen table, where we feast on Italian panettone, fresh fruit and berries, and warm mugs of hot coffee. Pajamas, robes, and fuzzy socks are the official attire of the day. After eating breakfast, we head to the living room, where we grab our stockings and slowly open them, one gift at a time, attempting to prolong the process as long as possible. Some little traditions have changed over the years, and others have remained the same for as long as I can remember. Panettone is one of those long-time traditions that won’t be going away anytime soon–or ever. Some people go gaga for Christmas cookies, I go gaga for a nice, thick slice of panettone. It literally tastes like the holidays to me. 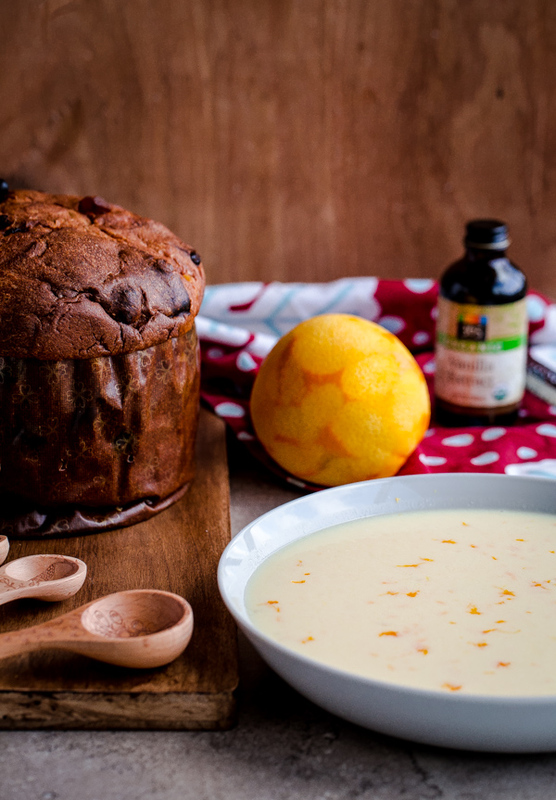 And sadly, before you ask, we do not make homemade panettone from scratch. I’ve tried with little success and decided that no recipes replicate the flavor or texture of the imported variety–plus, one only has so much time over the holidays. Despite that little confession, my family’s panettone snobbery has grown by leaps and bounds over the years. We’ve tried and tested practically every one out there, and my sister is now responsible for bringing back several loaves of our (current) favorite from New York City’s Agata & Valentina every year. We’re usually very boring and eat it plain or with a little bit of butter. A good panettone doesn’t need much more than that. Generally, I’m not one to advocate messing with something so great. But for this buttermilk panettone french toast with cranberry compote, I’d be willing to make an exception. If you’ve ever had challah or brioche french toast before, you know that egg-filled, yeast breads make the best and most decadent French toast ever. 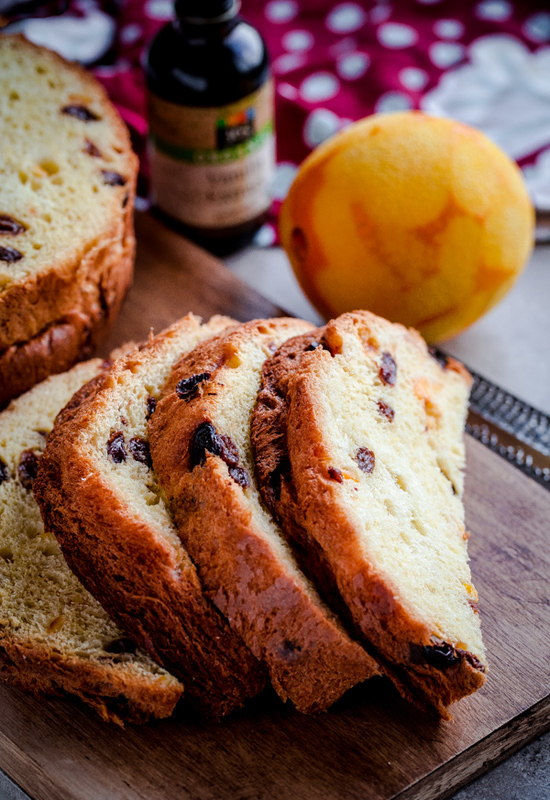 Now imagine using panettone, which has the added bonus of being filled with candied orange, raisins, citron, and zest. Perfection. Instead of soaking the french toast in a traditional milk mixture with eggs and other spices, this French toast is soaked in a buttermilk mixture with orange zest and a touch of vanilla extract. It is spectacular! My mom recently gifted me this beautifully written and photographed cookbook that is entirely made up of buttermilk recipes, and I happened to come across the idea for buttermilk French toast in the breakfast section. 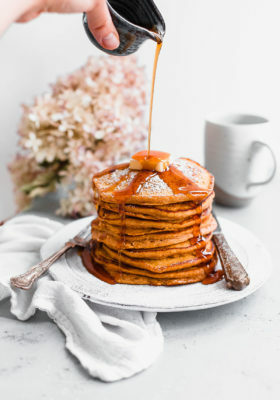 The author notes that she loves to use buttermilk for French toast, because it adds a subtle tartness that helps balance the sweetness of the dish. This is particularly true for Panettone, as it already is a sweet bread to begin with. 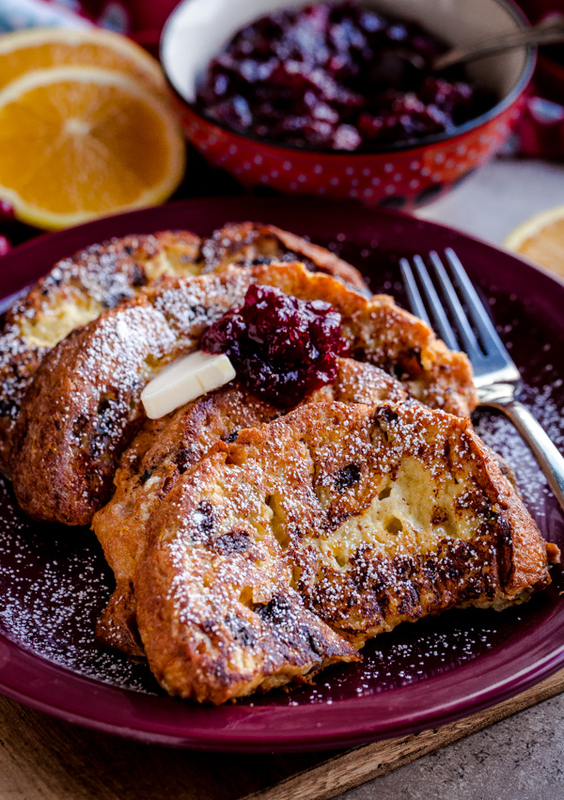 Since orange and cranberry are a match made in heaven, I decided to pair this French toast with a very simple cranberry compote. Just a little spoonful goes a long way, but it helps make this breakfast extra special. 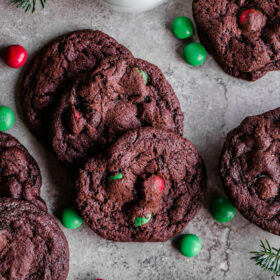 If you’re looking for a festive breakfast for Christmas morning, this is it! 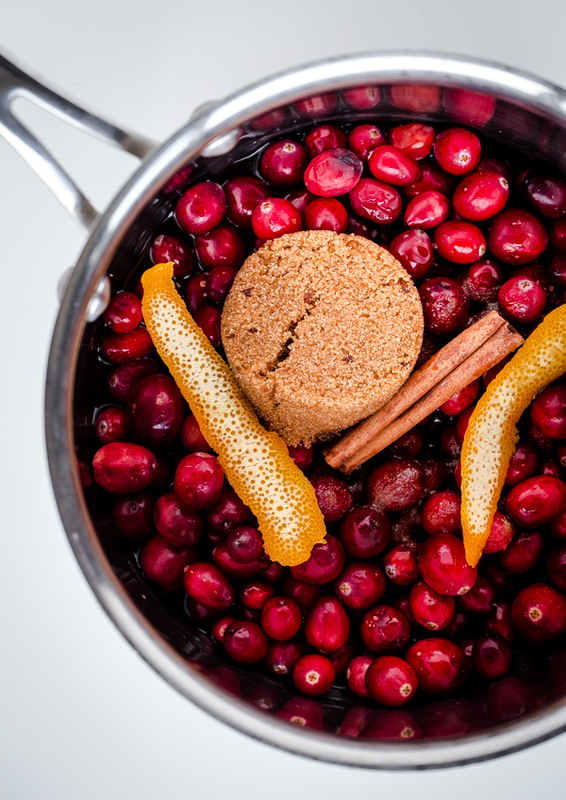 Prepare the Cranberry Compote: Combine all of the ingredients in a medium saucepan. Place over medium heat and bring to a low boil, stirring occasionally. Reduce the heat to a low simmer and cook until the cranberries have burst and the mixture has thickened. Set aside to cool. Remove the cinnamon stick before serving. Prepare the French Toast: In a large, shallow bowl, whisk together the buttermilk, eggs, granulated sugar, orange zest, and vanilla extract. Set aside. Remove the Panettone from the paper baking wrapper. Using a bread knife, slice the loaf horizontally into 1-inch to 1 and 1/4-inch thick round slices. Slice each round into half-moons. 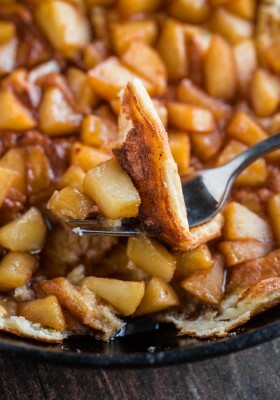 Heat a tab of butter in a large, non-stick skillet over medium heat until small bubbles begin to form. Right before cooking, dip the panettone slices, one at a time, in the egg-buttermilk mixture, turning them until they have just become saturated (*if your Panettone is very fresh, do this step extremely quickly, as the bread is delicate and can become mushy quickly). Allow any excess egg-buttermilk mixture to drip off, and place in the hot buttered pan. Avoid over-crowding the pan. Cook the french toast until golden brown on each side, flipping carefully with a wide heatproof spatula. 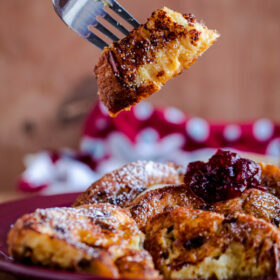 Top the hot Panettone French toast with a spoonful of cranberry compote, and serve immediately with maple syrup. Garnish with powdered sugar, if desired. 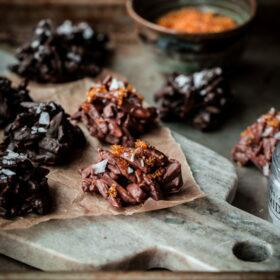 Recipe inspired by The Animal Farm Buttermilk Cookbook. You forgot to tell your readers about the time that I bought the panettone made from 100 year-old yeast, or whatever that was. 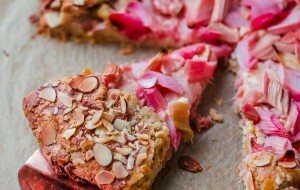 Oh, and now that you have made this for the blog Alessandra is going to be bugging you to make it at home! I have never had Panettone, but this has me thinking I need to get some! Funny thing is I just mad french toast and was SO CLOSE to making Cranberry Compote, but them didn’t becauseI did not want it to be TOO much with my recipe. It fits so perfect with this though. YUM! This looks like a great Christmas morning breakfast idea! Yummy! I love the idea of buttermilk in French toast. This looks delicious! Okay, just wiping away all the drool–seriously this looks SO amazing! I love Christmas morning (and hearing about everyone’s food traditions). We make homemade fried donuts and stuff them with everything from Nutella to peanut butter to jam. This French toast looks unbelievably good–we might have to add that to the mix! This looks wonderful and I want to try it! Did Pippa tell you that we have upped the ante even more this year, or rather she has! Yes, that fancy panettone,, that she mentioned that we had a few years ago and definitely not worth the money, was made with ” mountain churned” butter, no sea level butter for us! Makes all the difference! Christmas morning breakfast, done and done! Never had Panettone, but now I really want to. The problem is where to find that fancy bread in my small town! Oh well, I will just make peace by using regular bread with your delicious cranberry compote! Do you have any Italian stores, or Trader Joe’s nearby? If not, you may be able to order some online very easily now! 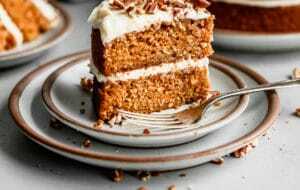 This would be great with challah or French toast though, I would just add a bit more orange zest and perhaps a bit of cinnamon to the batter to up the flavor (since the bread will no longer have as much flavor). Hope this helps! That is one sassy looking Panettone. I adore it! This sounds so amazing! Pinning! Laura…this looks sooo amazing! I love Panettone French toast 🙂 Look absolutely divine! So glad you like it!!! I don’t know why its taken me this long to make French toast with Panettone, it’s been on my agenda every year for a long time! Note to self – stop at Agata and Valentina on my way home from work today! I can’t think of a more festive Christmas breakfast. Yes! I forgot you lived so close to there too!